I’m so not Martha...so sue me. Here’s my Easter week project...the day AFTER Easter! 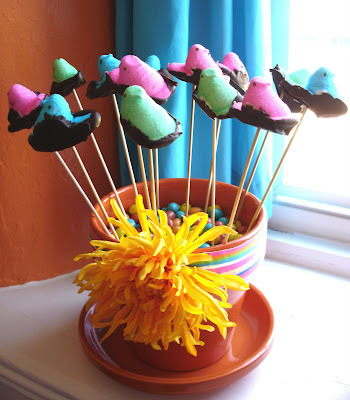 You'll recall I had planned to create a Peeps bouquet. I managed to eek this out an hour before we left for family dinner. I had to reconfigure the ribbon attachment after a small glue gun mishap, so it's a little lumpy but I fixed it after I took the pic. There wasn't really time to take a fabulous picture; we had to scoot! The car was really hot and the chocolate started melting and I had an asthma attack and was trying to take my coat off and get my inhaler and not cough into the bouquet...and I accidentally leaned over into a melty chocolate covered Peep that was lovingly arranged in the flower pot on my lap and I got a big glob of chocolate on my sweater. So we had to turn around, go back home, reboot...and we were late for dinner. Actually dinner was supposed to start at 3 and we were there at 3:03, but I guess folks got hungry because the Easter ham was down to a few slivers by the time we started filling our plates. So on the way home we stopped at Taco Bell. That’s our story and we’re sticking to it. One small tweak...next time I’ll work on the more even distribution of chocolate and lay the peeps on their bottoms instead of sides to cool. That and I'd start with the tape runner for attaching the ribbon and not the glue gun. Other than that I love this and it elicited a lot of 'oos and ahs'! Everyone was also really impressed and with the ‘I’m a little black sheep™” t-shirts we created for our new video using our awesome new YuDu. That is until Avalon’s 9-year old cousin showed off the Easter dress she made herself. Sheesh. Thanks a lot, kid. Way to steal my crafty thunder. Yeah...well...I get paid to make stuff. So there. Tune in tomorrow...we’ve got a brand new The Impatient Crafter™ video that shows you how to use the ProvoCraft YuDu machine! It’s a hoot in a handbasket, I swear! 1. Run two lines of tape along rim of pot and adhere ribbon smoothing out any wrinkles as you work. 2. Remove flower from stem and use hot glue to attach to place where ribbon ends meet on pot. 3. Cut Styrofoam to fit into pot, leaving about 2” from top for candy. 4. Place a layer of tin foil on top of Styrofoam, sealing any gaps. 5. Pour gum or jelly beans on tin foil covering it completely. 6. Insert skewers into pot, leaving space for Peeps to fan out and not touch. 7. Melt chocolate chips on stove using a double boiler method. 8. Cover two large cookie sheets with foil. 9. Holding Peeps by their heads; swirl their bottoms into the chocolate. Use a silicone spatula to coat sides. Place Peeps on tray standing up. 10. Place trays of Peeps in fridge to cool. 11. Gently slide a cooled Peep on each skewer. Place extra Peeps on ceramic dish. 12. Eat them with gleeful abandon after soaking in the generous compliments of friends and family. The best part is that you posted this after Easter! lol! You are SO ready for next year! The back story to Easter dinner and what must have been an unusually small ham is titallating...but you knew it would be! that is super cute!!! i want tomake it next year!!! Ha, you posted the day after Easter and I read it a year and half later. I am always late to the party! Very cute, Jordan loves peeps.